How many of us haven’t said those things through our life and had to live with the consequences? “Experience is the best teacher, but charges expensive rates”. How do we rationalise those things? Explain them without understanding them. A moment of madness. Something came over me. Moonstruck. The Andrew Gaff hit that broke Andrew Brayshaw’s jaw early in the third quarter turned a scrappy Western Derby into the biggest talking point of an otherwise glorious weekend of AFL footy. Sitting in the stand I had no idea what had happened at the time. The incident occurred a long way off the ball and there was no replay on the big screen. All I knew was that the Dockers suddenly began head hunting. I thought it was just niggle. A Cain and Abel thing because the little brother was now being humiliated on the scoreboard by the big brother. 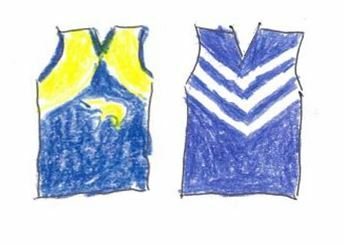 The Dockers had nothing to lose from frees or suspensions so why not “fly the flag” – and the Eagles responded in kind. As a tactic it seemed to work and the Eagles players got sucked in, rather than making their response on the scoreboard. The umpires understandably became “whistle happy” to try to restore control, but the scrap became a rabble. Just before 3/4 time my nephew got a text from his mate – “Gaff will get 6 weeks”. At 3/4 time I check the AFL app on my phone. On first look the video is vague. What am I looking for? It’s in the distant background on the far side of the ground a long way behind the ball. Gaff is trying to run to get to the next contest. Playing his long suit as he does a hundred times every game. Getting on his bike and running to space. Brayshaw is scragging or trying to block his run. Something that every tagger does a hundred times a game. Our Mark Hutchings has used it to great effect to close down Sidebottom, Sloane and Mitchell – to our applause for his ‘hardness’ and ‘smarts’. Gaff pushes him off with a right arm fend, and then swings a stiff arm back with a clenched fist as Brayshaw turns and steps across to block him again. In boxing its called a “lucky punch”, “swinging from the rafters” in a losing fighter’s desperate attempt to connect. This is the obverse. An “unlucky punch”. A frustrated player throwing a “don’t argue” in an attempt to get clear and connecting exactly where he didn’t want. The chin instead of the chest. “Shxx”. “Fxxk”. On the sixth replay there is no alternative but to believe my eyes, and I pass the phone to the Avenging Eagle and then on to her brother and our nephew. They reluctantly concur. As we all struggle to explain the inexplicable. Seagulls? Martians? Gaff? Brain fade – we reluctantly concur. The final quarter is spiteful if uneventful. Gaff kicks a long goal to rapturous applause from an Eagles home crowd that mostly hasn’t seen the incident, only the Dockers response. I can’t bring myself to join in. The Avenging Eagle’s (almost) equally rabid girlfriend texts “can’t remember feeling so flat after a 10 goal win”. We nod and wander home to Jack Irish rather than the usual replay. And the game that broke out between the fights, you ask? The young Dockers side – sans Fyfe and Sandilands – showed heart and run. David Mundy was a joy to watch in the midfield with his clean hands and footy smarts. Andrew Bradshaw (gulp) joined him in a first half where the Dockers won the hitouts and the clearances. Young Goliath Sean Darcy will be a capable Sandilands replacement. The Dockers had nothing up forward. Ballantyne relished the fights more than the footy. Matt Taberner looks a likely type at full forward and clunked some nice marks on his return from injury, but his kicking was woeful. Michael Walters took two of the best speccies you could see, but was not at his dangerous best. Brad Hill ran and used the ball well. Lachie Neale was well contained by our (gulp) tagger Hutchings. Since Nic Nait’s injury the story for the Eagles has always been about getting enough midfield ball to make use of our potent tall forwards. The backline is our strength and was rock solid again yesterday with Brad Sheppard starring in his 150th game and Shannon Hurn mopping up like Sadie. Darling was dangerous and worked hard, but is twice as effective when JK is back to let him use his legs to find space. The two livewire indigenous forwards Rioli and Ryan played together for the first time in months and seemed to find a more harmonious partnership, even if the opposition was modest. Ryan in particular seemed to follow a game plan more and not just play instinctive “highlights reel” for his own gratification. Jack Redden was my best on the day with his tireless running and clean disposal. Elliot Yeo won the Kangaroo/Hawk Medal and he is now our most valuable player with his physical presence and speed, but his disposal alternates between penetrating and erratic. Gaff ran himself ragged with 33 touches and is not directly replaceable with his ability to find space and get to repeat contests. His kicking has improved markedly this year, and I would guess he is in the Brownlow top 3 to date. Our rucks now battle to break even at the taps, but Lycett is tireless around the ground. Nathan Vardy is getting better with each hit out after a long injury absence, and might have his timing back by finals time. No-one starred for my Eagles, but it was a solid enough effort with only Shuey (after a difficult personal week) and LeCras not getting a pass mark. Three tough matches to finish with a snarling Port away; the dangerous Demons at home; and the emerging Lions away. No certainties there. We are fortunately a game and a half clear in second while we regroup, and more adversity will further bond an already tight knit unit. My Ladder Predictor says Richmond; Melbourne; Hawthorn; Eagles; Port; GWS; Collingwood; Kangaroos with us only winning one of the last three and facing the Tigers at the MCG in the first qualifying final. The Cats face an early elimination final against their old enemy this weekend. I have a good opinion of the Demons enormous talent if they have yet learned how to win tight games against quality opponents. Their final round clash with the Giants will likely determine a double chance for both sides. I thought we were a 20% chance to make the Grand Final, but without our best running player it is now more like 10%. No single player can take his place, so I can only hope that the rest of the midfield lift to compensate. My heart says Gaff should get 4 games; but my head says 8. If he was the victim rather than perpetrator I would demand no less. While I am sure he did not intend to hit Brayshaw in the head; the punch was intentional and reckless as to the consequences. Like my golf – he hit a target he wasn’t aiming at. The AFL has been negligent in allowing cheap shots off the ball to proliferate with fines for misconduct, rather than suspensions for striking. Financial penalties don’t change behaviour among wealthy young men, but letting down your team mates and coach does. Similarly with taggers. More free kicks should be given for holding and jumper punches/slaps off the ball. I have long detested the cheapening of the game and diminishing talented ball players with holding, scragging and cheap hits from less talented players and teams. As a kid I saw triple Magarey Medallist Lindsay Head getting suspended for retaliating to taggers in the years before video evidence, after years of “copping it sweet”. While the aggression is less malicious in the video era; it is even more relentless. It feels like there has been a “death” in the family. For the innocence of competitive sport played hard but fair. For Andrew Brayshaw and the rest of his family (younger brother Hamish is on the Eagles list). For Andrew Gaff and possibly his future as an Eagle (could he face team mates if we lost a preliminary final by a kick?). And for my Eagles premiership hopes. Bring on Port Adelaide next Saturday. The sun sets to rise again. My Votes: J Redden (WC) 3; B Sheppard (WC) 2; D Mundy (F) 1. PB, I think that a most fair minded summation of the whole affair. It was most surprising to hear that Gaff was involved, but there’s no way to avoid the consequences of the action. Interesting how perceptions at the ground and on TV differed. The crowd’s applause for Gaff later in the game seemed incomprehensible. But we on TV had already seen at least a dozen replays. And had some idea of the consequence. With no Nic Nat or Gaff, you have lost a lot of midfield drive. Intended or not, it was a costly indulgence. am feeling the pain of this whole situation. There are no winners here. It’s funny, my youngest at 23 just told me of something weird that happened driving back along King Street this afternoon. She said the car in front had Eagles Gaff 3 posters pinned on side back windows and rear window, all hand drawn and the woman inside started to wave an Eagles flag out the window. She asked me what was going on. What was that all about? It is a strange thing to do, but obviously a supporter trying to support. Not sure it was the way to go. Sad situation for a moment of stupidity or reaction to have these consequences for both men and their futures. The Gaff hit reminds me of the Houli one. he didn’t mean to clout him. but it happened. agree re the taggers and the scraggers. thought it then and think it now. That’s pretty insightful I reckon, PB. Excellent to read of events from you being at the ground. Yer man Gaff’s intentions may not have been sinister. The extreme analogy is with involuntary manslaughter versus murder, I guess. A hefty penalty should befit the consequences here. It’s all open from here. Wide open. Good to read such a balanced report, PB. I’m glad that Gaff has reacted to this in the way that he has. He is obviously mortified that this happened and has responded in a mature manner, pleading guilty, offering a genuine apology and expressing concern for his victim. His words at the hearing last night showed us how remorseful he is, not wanting to finish the game, feeling sick to the pit of his stomach. Let’s just all be grateful that, whilst the injury is severe and was totally unnecessary, Andrew Brayshaw will make a full recovery and Andrew Gaff will recover also, in time. It could have been so much worse. I am not trying to belittle how serious this is and young Brayshaw will be in pain for a long period of time but, luckily, they both get to walk away. There is nothing sadder than young lives being ruined by such events and that could so easily have occurred. So out of character. A number of my children’s friends know him well from his school days and Gaff is the last person they would have expected this from. Still it is an aggressive game that they play. He will do his time and it will be the least of his worries. Mending bridges with his mates, his team-mates, his club and restoring his reputation as a clean ball player are more important.